Is our universe unique? From science fiction to science fact, there is a concept that suggests that there could be other universes besides our own, where all the choices you made in this life played out in alternate realities. 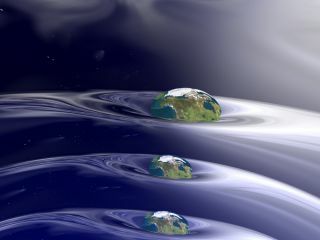 The concept is known as a "parallel universe," and is a facet of the astronomical theory of the multiverse. 1. Infinite universes. We don't know what the shape of space-time is exactly. One prominent theory is that it is flat and goes on forever. This would present the possibility of many universes being out there. But with that topic in mind, it's possible that universes can start repeating themselves. That's because particles can only be put together in so many ways. More about that in a moment. 2. Bubble universes. Another theory for multiple universes comes from "eternal inflation." Based on research from Tufts University cosmologist Alexander Vilenkin, when looking at space-time as a whole, some areas of space stop inflating like the Big Bang inflated our own universe. Others, however, will keep getting larger. So if we picture our own universe as a bubble, it is sitting in a network of bubble universes of space. What's interesting about this theory is the other universes could have very different laws of physics than our own, since they are not linked. 3. Daughter universes. Or perhaps multiple universes can follow the theory of quantum mechanics (how subatomic particles behave), as part of the "daughter universe" theory. If you follow the laws of probability, it suggests that for every outcome that could come from one of your decisions, there would be a range of universes — each of which saw one outcome come to be. So in one universe, you took that job to China. In another, perhaps you were on your way and your plane landed somewhere different, and you decided to stay. And so on. 4. Mathematical universes. Another possible avenue is exploring mathematical universes, which, simply put, explain that the structure of mathematics may change depending in which universe you reside. "A mathematical structure is something that you can describe in a way that's completely independent of human baggage," said theory-proposer Max Tegmark of the Massachusetts Institute of Technology, as quoted in the 2012 article. "I really believe that there is this universe out there that can exist independently of me that would continue to exist even if there were no humans." 5. Parallel universes. And last but not least as the idea of parallel universes. Going back to the idea that space-time is flat, the number of possible particle configurations in multiple universes would be limited to 10^10^122 distinct possibilities, to be exact. So, with an infinite number of cosmic patches, the particle arrangements within them must repeat — infinitely many times over. This means there are infinitely many "parallel universes": cosmic patches exactly the same as ours (containing someone exactly like you), as well as patches that differ by just one particle's position, patches that differ by two particles' positions, and so on down to patches that are totally different from ours. Famously, physicist's Stephen Hawking's last paper before his death also dealt with the multiverse. The paper was published in May 2018, just a few months after Hawking's demise. About the theory, he told Cambridge University in an interview published in The Washington Post, "We are not down to a single, unique universe, but our findings imply a significant reduction of the multiverse to a much smaller range of possible universes." Marvel Comics and DC Comics feature stories set in parallel universes that are part of the multiverse. Many anime series, such as "Digimon," "Dragon Ball" and "Sonic the Hedgehog" feature alternate versions of their characters from other universes. Parallel universes appear in games such as "Dungeons & Dragons," "BioShock Infinite," the "Final Fantasy" franchise, "Half-Life," "League of Legends," "Mortal Kombat" and "The Legend of Zelda." "Flatland: A Romance of Many Dimensions" (1884), by Edwin A. Abbott, is a story about a two-dimensional world that includes living geometric figures such as circles, triangles and squares. The novel also includes other universes such as Lineland, Spaceland and Pointland. This book was adapted into a feature film in 2007. "Men Like Gods" (1923), an H.G. Wells novel, included a "paratime" machine and explored the multiverse. "The Chronicles of Narnia" (1950-56), a C.S. Lewis book series, features several children who move between our world and the world of Narnia, where there are talking animals. Some of these books were released as feature films earlier in the 2000s. An episode of "Star Trek" featured a "mirror universe" in which the characters were more ruthless and warlike. The concept was repeated in nearly every subsequent "Star Trek" series. In 2009, the "Star Trek" universe got a reboot in a movie that put the characters from the 1960s original series in an alternate universe. The movie starred Chris Pine and Zachary Quinto and set off a series of other "Star Trek" films. In "The Dark Tower," a Stephen King series that began in 1982, travellers go through portals to different levels of the titular tower (in other words, parallel Earths). Part of the series was adapted into a feature film in 2017. The "Back to the Future" movie series (which began in 1985) follows the adventures of the McFly family, including visits to 1885, 1955 and 2015. The second film in particular shows the drawbacks of an alternate reality, when one character uses it to get rich by nefarious means. The series starred Michael J. Fox. In the "His Dark Materials" series by Philip Pullman, children move between multiple worlds. The first book, "The Golden Compass," was adapted into a film in in 2007. "Sliding Doors" (1998) is a film that showed two parallel universes depending on whether the main character caught a train or not. It starred Gwyneth Paltrow and John Hannah. "Run Lola Run" (1998) is a film starring Franka Potente. The film shows multiple alternatives as a woman tries to get 100,000 Deutsche marks in only 20 minutes to save her boyfriend's life. "Timeline" (1999) by Michael Crichton follows historians who go back in time to the Middle Ages. (While the book is mostly a time travel book, the multiverse is used in it as well.) A film based on the book was released in 2003. "Donnie Darko" (2001) is a film in which a high school student finds himself confronted with visions and tries to figure out their meaning. It starred Jake Gyllenhaal. "The Long Earth" book series, by Terry Pratchett and Stephen Baxter, discusses parallel universes that may be nearly the same as Earth. "Stranger Things" (2016 to present) is a science fiction-horror television series that begins with the investigation of a young boy's disappearance in a small town. The series includes discussion of an alternate dimension called the Upside Down.